If you want to introduce some gorgeous, app-controlled color into your life that is audio-aware and which dances to the beat of your tune, then this is the deal for you! 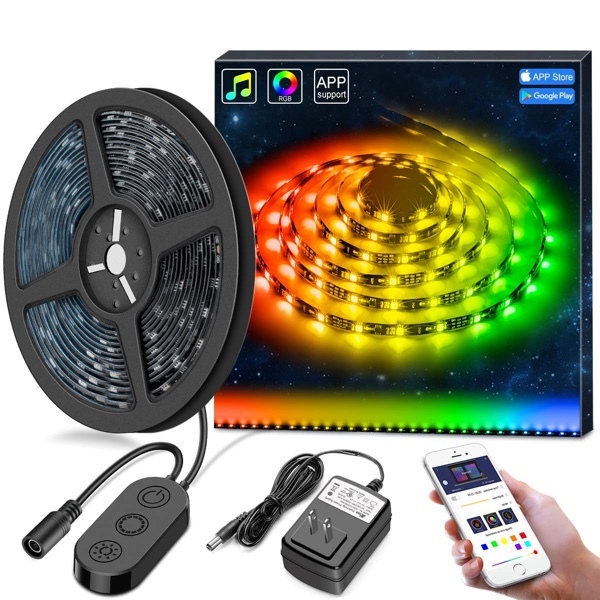 For what is likely to be a limited time only offer, this stunning MINGER DreamColor LED light strip is being offered for less than $20. This stunning LED light strip makes the perfect accessory for someone that wants to add glorious color to a home office or within a smaller room that acts as a home theatre, or similar. This deal is going to get you 16.4-foot of LED lights mounted on an easy-to-use strip which can be rolled out and clagged onto your desk, until, wall, or another area at will. It offers easy control via an application on your smartphone and will immediately drown your room in uniquely chosen color combinations. One of the biggest benefits of this strip lighting is that it doesn’t come with a cheap remote control that is going to get lost easily or which is going to run out of battery life at the most pivotal time. Everything is controlled directly from the application on your device which offers entire control over the hardware and makes sure that is convenience is right in your hands. If you lose your phone, then you really need to take a look at your life choices but you can, of course, simply download the app onto a new device. Users will also love the wonderful Music Mode which comes with this hardware. The light strip has a built-in high sensitivity microphone to adjust the color automatically based on the ambient sound. That means that you are going to be able to throw the perfect party that will blow people’s minds as they watch the lights react and dance to the sound of the playing music. Decorate your bedroom. Decorate the office. Hell, for this price, decorate every room in your property with beautiful color that comes alive when the music starts. Just make sure that you grab the purchase right now while you can still make huge savings.